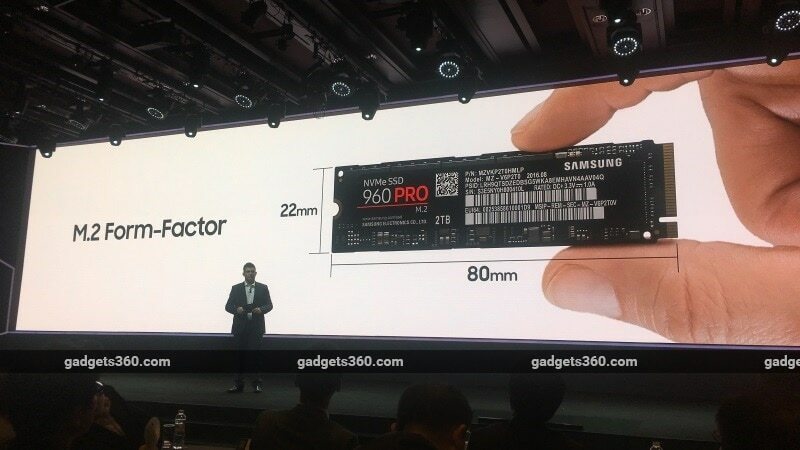 At its annual Samsung SSD Forum in South Korea on Wednesday, Samsung has announced the launch of its next generation top-of-the-line SSDs - the Samsung 960 Pro and 960 Evo. Both drives are based on the M.2 form factor which Samsung used for the first time with the 950 Pro last year, and pack in significant performance improvements compared to their predecessors. The flagship Samsung 960 Pro is capable of sequential read and write speeds of up to 3500MB/s and 2100MB/s respectively, compared to the 950 Pro's maximum read and write speeds of 2500MB/s and 1500MB/s respectively, which applied to the 512GB model. 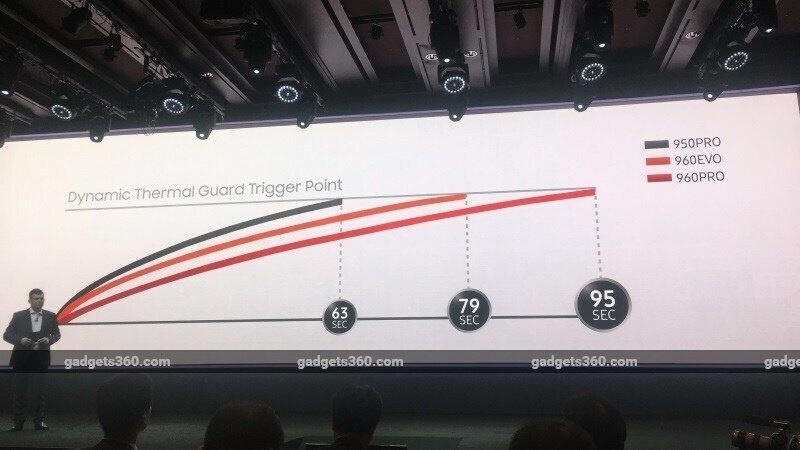 All three 960 Pro models introduced - 512GB, 1TB, and 2TB - are capable of the same read/write speeds, a change compared to last year, when the lower capacity 950 Pro drives were slower as well. The new Pro drives are capable of hitting 440,000 and 360,000 input-output operations per second during random reads and writes respectively. These performance improvements are down to the new Samsung Polaris controller featured in the 960 series of drives, which packs 5 cores, compared to 3 cores in the previous generation UBX controller on the 950 Pro. One of the five cores is dedicated to directing the communication between the host and controller, which contributes, in part, to the overall speed improvements. The 960 Pro also benefits from increased cache in the 1TB (1GB cache) and 2TB (2GB cache) models, while the 512GB model continues to ship with 512MB cache as seen on the 950 Pro. The Samsung 960 Evo series is a bit slower than the Pro, but thanks to the improved Intelligent TurboWrite technology, it packs significant improvements when compared to the Samsung 850 Evo. The 960 Evo is capable of sequential read speeds up to 3200MB/s, with sequential write speeds varying based on the capacity of the drive - up to 1500MB/s on the 250GB model, up to 1800MB/s on the 512GB model, and up to 1900MB/s on the 1TB model. The IOPS figures for the 960 Evo stand at 380,00 and 360,000 for random reads and writes respectively. The eagle-eyed would've noticed that there'a significant increase in the maximum storage capacity available at launch, from 512GB last year, to 2TB in this year's Pro model. Samsung says it has been able to pack this much storage on the M.2 form factor, which measures just 22x80mm, thanks to its new 'advanced packaging technology' that allows it to stack 16 layers of third-generation 32GB MLC V-NAND chips on top of each other into a single package, with additional circuitry added to each chip to make this possible. 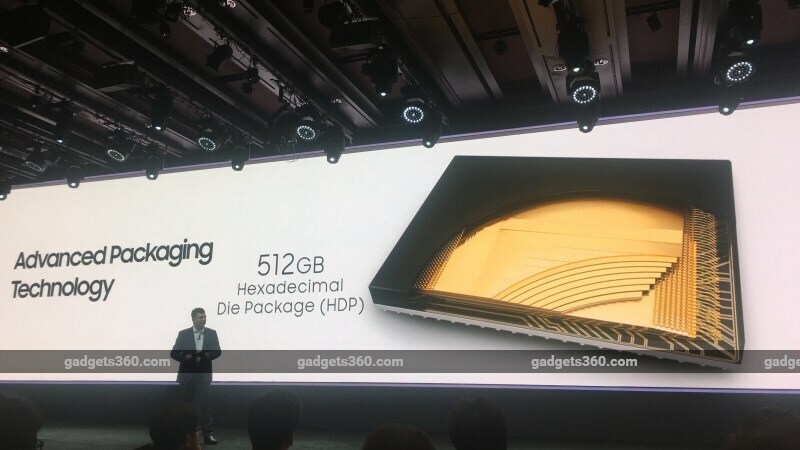 Four of these hexadecimal die packages can then be used in a 2TB drive, in what Samsung is calling the 4-Landing design. Samsung says the DRAM package is mounted on top of the controller package to further save space. Like the 950 Pro before them, the Samsung 960 Pro and Samsung 960 Evo use the PCIe 3.0 x4 interface and are compliant with the NVMe specifications (1.2 compared to 1.1 on the 950). They also pack a new heat-spreading label that addresses heating concerns that some had raised with the previous generation of drives, and makes it possible for the 960 series to perform at peak capacity for longer durations before any throttling needs to occur. The Samsung 960 Pro and 960 Evo will ship with a brand new version of 'Magician', the software that is used to manage Samsung's SSD drives. Samsung says the software has been completely redesigned with focus on providing a more intuitive UI. The Samsung 960 Pro comes with a 5-year warranty - or 400TB Writes (TBW) for the 512GB drive, 800TBW for 1TB, and 1200TBW for 2TB, whichever is sooner. The 960 Evo line carries a three-year 100TBW (250GB), 200TBW (500GB), 400TBW (1TB) warranty. The Samsung 960 Pro starts at $329 (approximately Rs. 22,000) for the 512GB variant, while the 1TB variant is priced at $629 (approximately Rs. 42,100), and the top-of-the-line 2TB drive will be priced at $1299 (approximately Rs. 87,000) in the US. 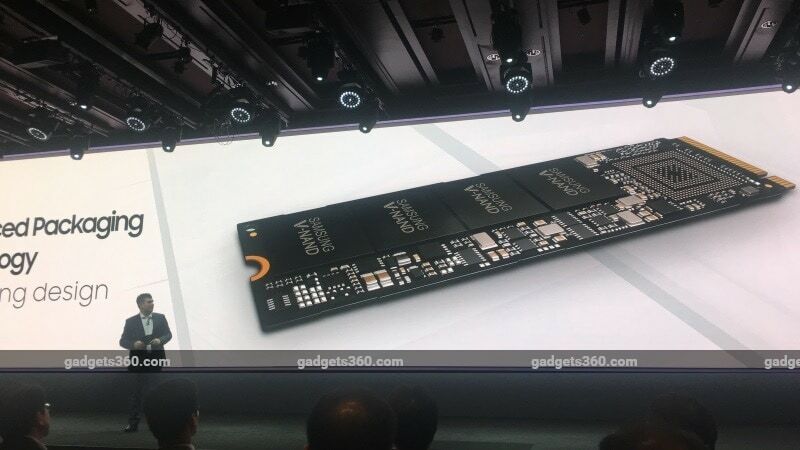 The Samsung 960 Evo will be available at $129 (approximately Rs. 8,600) for the 250GB model, $249 (approximately Rs. 16,700) for the 500GB model, and $479 (approximately Rs. 32,100) for the 1TB variant. The drives will start shipping in October in select markets, with an India launch expected later this year. Disclosure: Samsung sponsored the correspondent's flights and hotel for the event in Korea.